The main objective of studying decentralized supply chains is to demonstrate that a better interfirm collaboration can lead to a better overall performance of the system. Many researchers studied a phenomenon called downstream demand inference (DDI), which presents an effective demand management strategy to deal with forecast problems. DDI allows the upstream actor to infer the demand received by the downstream one without information sharing. Recent study showed that DDI is possible with simple moving average (SMA) forecast method and was verified especially for an autoregressive AR(1) demand process. This chapter extends the strategy's results by developing mean squared error and average inventory level expressions for causal invertible ARMA(p,q) demand under DDI strategy, no information sharing (NIS), and forecast information sharing (FIS) strategies. The authors analyze the sensibility of the performance metrics in respect with lead-time, SMA, and ARMA(p,q) parameters, and compare DDI results with the NIS and FIS strategies' results. A supply chain consists of two or more agents that integrate with each other to create and deliver value to end customers. A decentralized supply chain is characterized by independent agents with asymmetrical information. In fact, in this form of supply chain, most supply chain agents may not share information due to privacy policies, information quality, or system incompatibilities. Each actor holds his own set of information and tries to maximize his objective (minimizing costs / minimizing stocks) according to the available settings. As a result, agents control their own activities in order to improve their own competitiveness, which leads them to make decisions that maximize their local performance by ignoring other agents or even the end consumer. These decisions are short-sighted because they do not take into account the performance of all partners to satisfy this consumer. Over the last years, a major movement of business partner’s integration to implement advanced and collaborative replenishment processes has appeared. Supply Chain Management (SCM) has emerged in the service and production sectors to identify and take advantage of new improvement sources in business competitiveness. SCM therefore proposes strategies and methods to reduce the costs whose origin is mainly due to poor coordination of operations. The observation of the implementation of the collaboration method is very encouraging. Companies can better satisfy the consumer, by offering more product availability, services with fewer delays, while being more efficient by having less inventory, making better use of resources and achieving a better return on employed capital. One of the most important data to be shared is consumer’s demand. In most industrial sectors, the volatility of final customer demand must be well taken into account by all actors in the supply chain, as demand is the primary driver of the benefits for the entire supply chain. Predicting customer demand can be the key to secure inventory levels and lower inventory costs. Disney and Towill (2002) and Ireland and Crum (2006) reported that inventory levels can be reduced to 50% and inventory costs reduced to 40%, leading to competitive success. In recent years, numerous studies have highlighted the importance of information sharing in the supply chain (Barratt, 2004, Lambert and Cooper, 2000, Lau and Lee, 2000, Trkman et al., 2006). The question of this chapter is motivated by the work recently published by Ali et al. 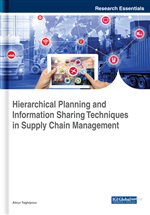 (2017), who investigated three different strategies for examining the value of information sharing in a two-tier supply chain under the assumption of an . demand process. The first strategy, called No Information Sharing (NIS), is a decentralized demand management strategy in which demand information is not shared and the upstream actor will simply base its forecast on orders received from the downstream actor. The second strategy, called Forecast Information Sharing (FIS), presents a centralized demand management strategy in which the upstream actor has access to downstream actor demand and bases its forecast on shared information. Between the NIS strategy, which presents sub-optimal solutions and the FIS strategy, which presents optimal solutions, a third approach, called the Inbound Demand Inference (DDI) strategy, makes it possible to improve the performance of the decentralized system in order to obtain quasi-optimal solutions. Instead of sharing demand information, both actors in the supply chain derive the demand and the demand deduced from the customer uses in the forecast. Ali and Boylan (2011) showed that DDI cannot be applied with optimal prediction methods, but only when the downstream actor uses the Simple Moving Average (SMA) forecast method.